This white rabbit is the lucky wearer of the world's first in-eye display. We always knew there was a reason those glasses-mounted virtual displays were so rubbish - manufacturers have been holding out on us and saving all the good stuff for gadget-laden contact lenses that will bring virtual worlds direct to our eyeballs. 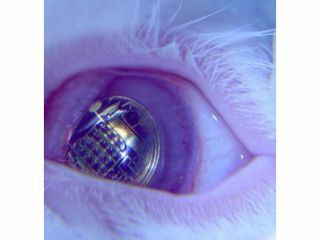 The lenses, developed at the University of Washington, may sound like the stuff of science fiction, but tests have already been carried out on some unfortunate rabbits like the one in the photo. When perfected for human use, the lenses could bring anything from immersive video gaming to multi-purpose screens that deliver data from all our electronic devices, including phones and computers. The essence of the new lenses is a manufacturing technique that allows the potentially toxic materials used in a printed circuit to mesh with the biologically safe material needed in a contact lens. Researchers created a fine powder of components that use capillary action to self-assemble into the correct configuration on the lenses when sprinkled over them. The current simple lenses contain circuitry and tiny red LEDs that form a rudimentary display, although the issue of delivering the power to illuminate them has not yet been solved. That's likely to come from radio-frequency power and solar cells on the outside of the lens. While the test-bed rabbits weren't able to access Terminator-style readouts and a final product is still many years off, the prototypes are proof of a concept that is likely to horrify as many folk as it excites.